The Line 6 POD's sudden arrival on the scene in 1997 hit guitarists like a smack on the side of the head with a rolled up newspaper. No-one saw the little red kidney bean-shaped modelling unit coming, mainly because the bods at Line 6 were great at keeping secrets. "Our company at the time, Fast Forward Designs, had five phone lines," said Line 6 founder Marcus Ryle. "When we started the new brand, it was the sixth phone line - hence Line 6. It began as a code name, because we were developing our modelling technology and wanted to keep this research a secret. "So when one of our clients came to visit, the receptionist would say we had a call on Line 6. Since Line 6 didn't exist, we knew that actually meant, 'Shut off the amplifiers and behave for a bit!'" The POD wasn't the first groundbreaking piece of kit from Line 6. While the brand unveiled its AxSys 212 modelling amp in 1996 to a reasonable ripple of enthusiasm it was only when the boffins crammed the combo's technology into the iconic red bean that guitarists realised that their lives had changed forever. Suddenly, you could capture the sound of a vintage Marshall 'stack' or a crisp Fender Twin Reverb combo at bedroom level - in the middle of the night if that was your thing. The first POD (otherwise known as the 1.0) featured 16 guitar amp models and a bunch of cabinet types and effects. The pimped POD 2.0 appeared in 1999 with an increased backline arsenal of 32 amp models. The next generation PODXT came with 36 amp models, and the X3, packing an impressive 78 models into its inner brain, followed a few years down the line. The POD has been repackaged many times since its original launch including as floor-mounted units and the mini-me Pocket POD. 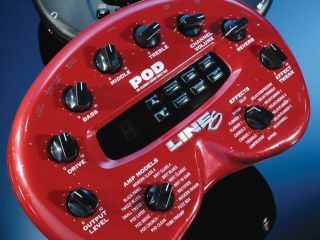 You can even turn your iPhone or iPad into a POD with Line 6's Mobile In interface and Mobile POD app. What makes the original POD and its subsequent descendents so special is the quality of its modelling. The Line 6 experts realised that they had to replicate every component of the donor amplifier's sound. Not only did they replicate it, they nailed the vibe of classic gear so well that everyone from bedroom warriors to first call session guitarists soon found they couldn't live without that little red bean.